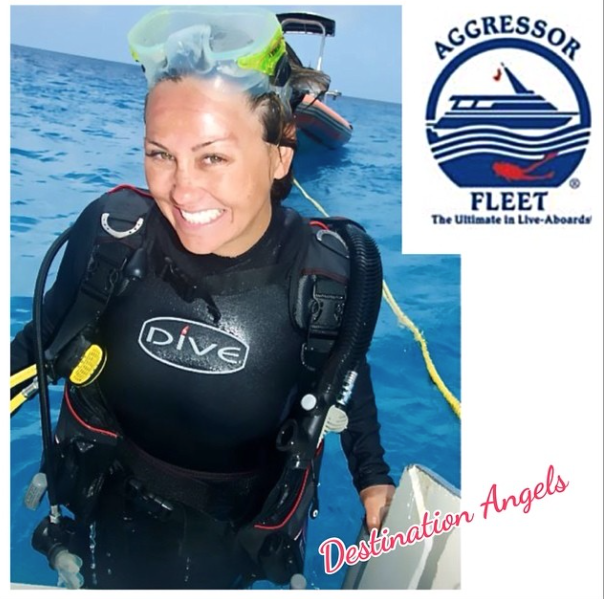 The Destination Angels – DIVE TRIP with The Aggressor…. DIVE TRIP with The Aggressor…. A must do, bucket list, extreme once in a lifetime adventure is a DIVE Trip and can be done pretty much at any age! A Dive trip with The Aggressor Fleet is a luxurious, attainable, once in a lifetime diving experience. With red carpet service, world class dining created by chefs from around the world, continuous morning, day and night dives guided by dive masters, videographers and photographers who capture it all so you can take your adventures home! Oh, and a warm and cozy towel finish and freshly baked snack waiting on dock after each dive. Starting with a morning tap on your stateroom door, coffee, tea or hot chocolate is delivered. Then shortly after a tinker bell sounds and breakfast is served. After all is digested, the main dive bell sounds – it’s “Dive Briefing Time” of our new location. Here we learn about what we’ll encounter below; the conditions, the depth, the wildlife, the reef formations and shockingly – pretty amazing how precise the crew briefing is. We sail to new locations overnight and during lunch – two different dive locations daily. When you dive with The Aggressor Fleet you can truly discover all that is meant to be discovered below the surface in that region of the world. Dive * Eat * Relax * Journal * REPEAT! Dives last about an hour, there are usually five dives daily offered including night dives, wreck dives, wall dives, cave dives – all guided by as much or as little guidance as desired. Aggressor talent and braun is always available which is comforting knowing that dives are 45 to 90 feet deep! At The Aggressor you can get PADI certified like I did and just after one “dive trip” I now have 25 dives under my belt! Yes – you can rent all your gear onboard which makes a pleasant travel experience to and from. All of The Aggressor divers that I meet while onboard were loyal Aggressor Fleet dive fans with hundreds of dives marked. They keep coming back to The Aggressor’s top of the line yachts and exceptional, knowledgeable crew as their dive boat of choice – which says it all. The Aggressor Fleet has many destinations all over the world to choose from. PADI certification starts at age 10. While onboard of The Aggressor you can get PADI Certified, NITROX Certified, Night Dive Certified, Navigation Certified, Emergency First Response Certified just to name a few. I have to say this was the best way for me to learn, being a nervous wreck, but playing it cool as I was traveling with my already scuba certified twenty-one year old daughter Deven at the time. What a fabulous trip for families, lovers, singles, empty nesters, and retirees. The Destination Angels gives the Aggressor Fleet TWO WINGS UP!